Winnetka (/wɪˈnɛtkə/) is a village in Cook County, Illinois, United States, located 16 miles (26 km) north of downtown Chicago. The population was 12,187 at the 2010 census. The village is one of the wealthiest places in the nation in terms of household income, and the richest in Illinois. Winnetka is located at 42°6′22″N 87°44′16″W﻿ / ﻿42.10611°N 87.73778°W﻿ / 42.10611; -87.73778 (42.106227, −87.73801). Winnetka is located 650 feet (200 m) above sea level and has a magnetic declination of 3° 10' W. According to the 2010 census, Winnetka has a total area of 3.893 square miles (10.08 km2), of which 3.81 square miles (9.87 km2) (or 97.87%) is land and 0.083 square miles (0.21 km2) (or 2.13%) is water. As of the census of 2010, there were 12,187 people, 4,102 households, and 3,328 families residing in the village. The racial makeup of the village was 94.8% White, 0.3% African American, 0.1% Native American, 3.3% Asian, 0.3% from other races, and 1.2% from two or more races. Hispanic or Latino of any race were 2.2% of the population. There were 4,102 households out of which 45.6% had children under the age of 18 living with them, 74.3% were married couples living together, 5.2% had a female householder with no husband present, and 18.9% were non-families. 17.3% of all households were made up of individuals[clarification needed] and 9.4% had someone living alone who was 65 years of age or older. The average household size was 2.97 and the average family size was 3.39. In the village, the population was spread out with 36.2% under the age of 19, 2.3% from 20 to 24, 15.2% from 25 to 44, 32.7% from 45 to 64, and 13.5% who were 65 years of age or older. The median age was 42.8 years. The median income for a household in the village was $207,955, and the median income for a family was over $250,000. The per capita income for the village was $105,575 in 2015. About 1.8% of families and 1.8% of the population were below the poverty line, including 1.6% of those under age 18 and 2.0% of those age 65 or over. The first houses were built in 1836 That year Erastus Patterson and his family arrived from Vermont and opened a tavern to service passengers on the Green Bay Trail post road. The village was first subdivided in 1854 by Charles Peck and Walter S. Gurnee, President of the Chicago, Milwaukee & St. Paul Railroad. Winnetka's first private school was opened in 1856 by Mr. and Mrs. Charles Peck with seventeen pupils. In 1859 the first public school building was built with private funds at the southeast corner of Elm and Maple streets. The first year's budget for this school was two hundred dollars. The village was incorporated in 1869 with a population of 450. The name is believed to originate from the Potawatomi language, meaning "beautiful place". The oldest surviving house in Winnetka is the Schmidt-Burnham House. Originally constructed on what is now the Indian Hill Club on the south edge of town and in 1917 moved to Tower Road, it was moved in 2003 from Tower Road to the Crow Island Woods. Winnetka's neighborhoods include estates and homes designed by distinguished architects including George Washington Maher, Walter Burley Griffin, John S. Van Bergen, Robert Seyfarth, Robert McNitt, Howard Van Doren Shaw and David Adler. Among Winnetka's celebrities are the late actor Rock Hudson and rock singer/songwriter/producer Richard Marx. Churches in Winnetka were also designed by noted architects. Among them, the former First Church of Christ, Scientist, 440 Ridge Avenue, was designed in 1924 by architect Solon S. Beman. In the 1920's, the famous Home Alone house was built on 671 Lincoln avenue. The Chicago and Milwaukee Railway was built in 1855 through Winnetka, connecting its namesake cities. It eventually became the Chicago & Northwestern Railway. Between 1937 and 1942 the railroad tracks through Winnetka were grade separated after several people were hit at grade crossings. In 1995 the C&NW was merged into the Union Pacific. Only Metra trains are operated on this track now; freight operations ended in the late 1980s. Winnetka has three Metra stations: Hubbard Woods, Winnetka, and Indian Hill. The Chicago, North Shore and Milwaukee electric interurban was built through Winnetka and the North Shore in the first decade of the 1900s, and the line through Winnetka was removed in 1955. This is now the Green Bay Trail bicycle path. In 1904 the Winnetka Park District was established, making it the fourth oldest park district in the state of Illinois. Today, the park district maintains and operates 27 parks, five beaches, and golf, tennis, ice skating/hockey, and paddle tennis facilities. The Crow Island School, designed by Eliel & Eero Saarinen and the architectural firm Perkins, Wheeler & Will, was declared a National Historical Landmark in 1990. It was declared 12th among all buildings and the best architectural design of all schools. 10,000 people attended the opening in 1938. In 1965, Martin Luther King, Jr. spoke in Winnetka. A plaque dedicated to him is on the Village Green, a park in the town, where he spoke. As a result of Dr. King's open housing campaign and the North Shore Summer Project, the nonprofit now known as Open Communities was founded. Winnetka was the site of the Hubbard Woods Elementary School shooting by Laurie Dann in 1988. She killed one student, wounded eight others and later committed suicide at another person's house. A song named "Big Noise from Winnetka" was recorded in 1938 by The Bobcats. Winnetka was named number 4 on the list of America's 25 top-earning towns by CNN Money in 2007. The film Home Alone is set in Winnetka, and featured scenes filmed at 671 Lincoln Avenue. The street address is mentioned in the film, but the street is called "Lincoln Boulevard". The opening scenes of the sequel Home Alone 2: Lost in New York were filmed at the same house. Numerous other films have been shot in Winnetka, including portions of films Ocean's 12, Breakfast Club, National Lampoon's Vacation, Ferris Bueller's Day Off, Sixteen Candles, Risky Business, Planes, Trains & Automobiles, She's Having a Baby and Uncle Buck. The film Contagion was filmed in the area in the spring of 2011. A popular TV series, Sisters (1991–1996), was set primarily in Winnetka, but was not filmed there, except for some exterior establishing shots. This was also true of its erstwhile summer replacement series, Winnetka Road. The characters on the TV series The League reside in Winnetka. The TV series I Didn't Do It is set in Winnetka. The characters attend the fictional Ditka High School. "Big Noise from Winnetka," a jazz standard, has been featured in a number of Hollywood movies including Let's Make Music and Reveille with Beverly. The Winnetka Public Schools system (District 36) consists of three elementary schools and two middle schools. Hubbard Woods, Crow Island, and Samuel Sewall Greeley (est. 1912) Elementary Schools serve grades kindergarten through four, students in fifth and sixth grades attend Skokie Middle School and seventh and eighth graders attend Carleton W. Washburne Middle School, named after educator Carleton Washburne. Winnetka's schools were modeled after Washburne's educational philosophy in an experiment called the Winnetka Plan. The town's schools continue to reflect his educational philosophy. Winnetka is in New Trier Township, and public school students who reside in Winnetka attend New Trier High School for grades 9 through 12. New Trier was named the 17th best high school in the country. Crow Island is a National Historic Landmark due to its significant architectural design. Media outlets covering Winnetka include the Winnetka-Glencoe Patch, the Chicago Tribune's TribLocal, the Pioneer Press, Winnetka Talk, and The Winnetka Current. Katie Chang, actress, lives in Winnetka and attended New Trier High School. Tom O'Halleran, member of the United States House of Representatives from Arizona's 1st congressional district. He lived in Winnetka while a member of the Chicago Board of Trade. Eliot Porter, photographer, was born and grew up in Winnetka. Fairfield Porter, painter and art critic, was born and grew up in Winnetka. ^ "Profile of General Population and Housing Characteristics: 2010 Demographic Profile Data (DP-1): Winnetka village, Illinois". U.S. Census Bureau, American Factfinder. Retrieved March 20, 2013. ^ "11 Chicago suburbs make list of 100 richest towns". Chicago Tribune. March 28, 2017. ^ "American FactFinder". United States Census Bureau. Retrieved 2017-04-05. ^ "City Data". city-data.com. Retrieved 2017-08-13. ^ "Community Profile / Winnetka". Los Angeles Times. 11 October 1998. Retrieved 3 November 2015. ^ "Crow Island School". National Historic Landmarks Program. ^ "Justice Day recalls Dr. King's visit to suburbs 50 years ago - Open Communities". 24 July 2015. Retrieved 25 March 2018. ^ "New Trier - New Trier named #17 high school in U.S., top Ill. open enrollment school on Newsweek list". www.newtrier.k12.il.us. Retrieved 25 March 2018. ^ "North Shore provides many opportunities for all students to excel - North Shore Country Day School (NSCDS)". www.nscds.org. Retrieved 25 March 2018. ^ Lewis, Morgan Milton; Emmons, Jessie Gray Mrs. (1903). Genealogical and Biographical Record of the Lewis and Grisell Families. Coopersville, MI: DeVos Printer. p. 148. ^ a b Peterson, Duff. "Eliot and Fairfield Porter, American Artists from Winnetka". Winnetka Historical Society. Retrieved 2018-01-16. ^ Manchir, Michelle (2014-07-13). "Barbara Turf, former Crate and Barrel CEO, dies at 71". Chicago Tribune. Retrieved 2014-08-11. Dickinson, Lora Townsend. The Story of Winnetka. Winnetka: Winnetka Historical Society, 1956. Print. 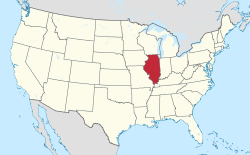 Wikimedia Commons has media related to Winnetka, Illinois.